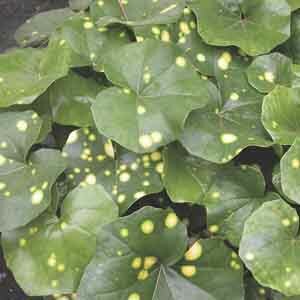 This plant gets its name from the bright yellow speckles that appear on its foliage, similar to spots on a leopard. The large round, leathery leaves add wonderful texture and color variation in the garden. Tall sprays of yellow flowers are a refreshing site in the autumn. Adds great form and structure to border gardens. A wonderful specimen for containers on the patio or deck, and well suited for naturalizing near water or in damp woodland settings. Plant in well drained soil, fertilize regularly. Protect from frost.